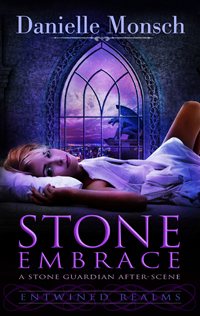 Please Note: Stone Embrace is not a complete story. It would best be described as an extended 30 page epilogue to the novel Stone Guardian. You'll probably have the most enjoyment reading this story if you have read Stone Guardian and already know the characters and world of the Entwined Realms series. Terak has fought all enemies to claim Larissa. It does not matter his own Clan looks upon the union with misgivings. It does not matter her family see a monster when they see him. It does not matter, because Larissa is his. And any who would try to take her away? They will see what a Gargoyle will do to protect his mate.